Today, I replayed scenario 2 from Avalon Hill's "Tac Air". In my previous playthrough, the Soviets had the West Germans on the ropes just outside the town of Bayreuth. However, a little intervention from some Tornadoes on an air interdiction mission ended up saving the day for NATO and shutting down the Soviet offensive completely. On this playthrough, I resolved to fix some of my earlier mistakes. As the Soviet commander, I placed the HQs closer to the frontline and surrounded them with interlocking air defenses. The West Germans did much the same and in order to avoid the beating from last time, they let a handful of units defend the town while setting a trap with a reserve of tanks and infantry. 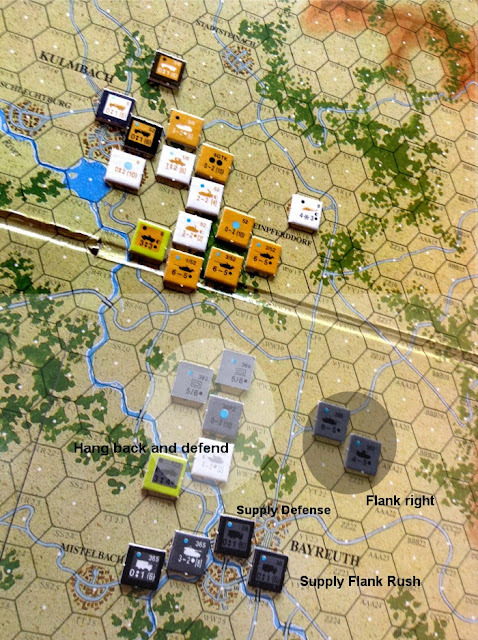 It's turn 4 in the second scenario in AH's classic WW3 game, Tac Air. 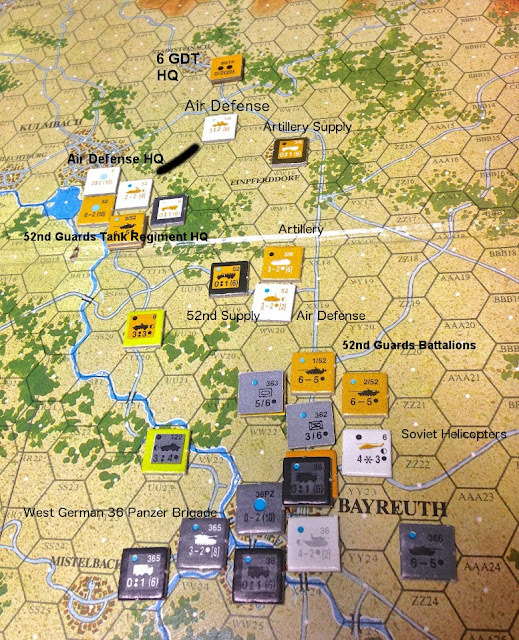 The Soviets and the West Germans have a "meeting engagement" as the 52nd Guards Tank Regiments pushes west to capture the town of Bayreuth. The West German 36th Panzer Brigade (12th Panzer Division) is trying to capture the eastern Soviet-held town of Kulmbach. What you are witnessing above is defeat snatched from the jaws of victory. The Soviets have been pushing very successfully towards the city of Bayreuth for three solid turns. The West Germans have suffered a completely destroyed tank battalion and although they wisely put their reserve units in defensive position on the outskirts of the city, they have been unable to stem the Soviet advance. 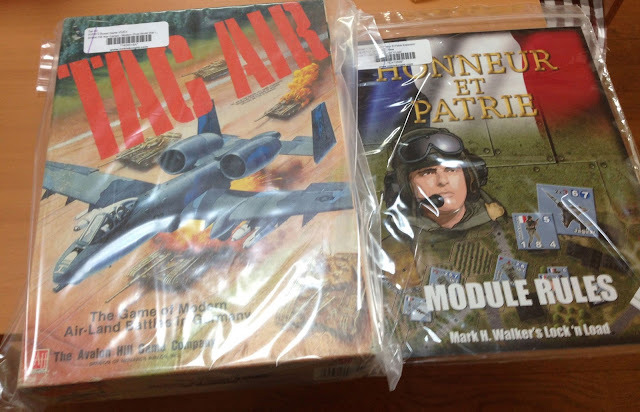 This week, my copies of Tac Air (1987 - Avalon Hill) and Honneur et Patrie (2012 - Lock 'n Load) arrived in the mail. This week, I had some time to sit down and play two great games from 1987, Air Superiority (GDW) and 7th Fleet (Victory Games). In the Air Superiority game, I tried the scenario out for the "Gulf of Sidra" dogfight between two Libyan Su-22s and 2 American F-14s. The Gulf of Sidra scenario recounts the August 19, 1981 incident where a pair of Libyan Su-22s fired on two Tomcats. The F-14s subsequently shot down both Su-22s and it was not until 1989 when the Libyans would try again (and fail again) to shoot down American fighters in the area. Since I haven't played a great deal of Air Superiority before and I found the steep learning curve intimidating on my first try, I decided to take it slow and played a couple of turns each night during the previous week. Most of the time was spent looking up rules rather than moving around my fighters but I felt a step closer to getting the system down.